USB-to-aux cables do exist, and they work for the purposes that they were designed, but they don’t work as a conduit for digital music files to your car radio. If you plug a USB thumb drive into a USB-to- aux cable and plug the cable into your head unit, nothing happens. The same is true, in most cases, if you plug a USB-to-aux cable into your phone and connect it to your head unit. Some phones and MP3 players are designed to output audio signals via USB connection, like the original HTC Dream that used a single micro-USB connector for both power and audio output, but most phones and MP3 players come with a standard 3.5 mm or 2.5 mm TRRS headphone jack for a reason. USB is a digital connection that transfers digital information, and a standard 3.5 mm TRRS auxiliary jack is an analog connection that expects an analog audio signal. There is some overlap between the two, as USB headphones exist, but USB headphones require an analog input via the USB connection. The main difference between USB and aux in car audio is that USB connections are designed to offload processing of audio data to the head unit, while aux connections are only capable of taking in an already processed signal. If you couldn’t plug a set of headphones into a device, then you can’t connect that device to your head unit’s auxiliary input either. There is a difference between headphone and line outputs, which is one of the reasons that people like to use USB to offload processing and amplification to the head unit. In most cases, when you plug a phone or MP3 player into the aux input in a head unit, you end up piping an already amplified signal intended for headphones rather than a line-level signal, which isn’t ideal in terms of sound quality. 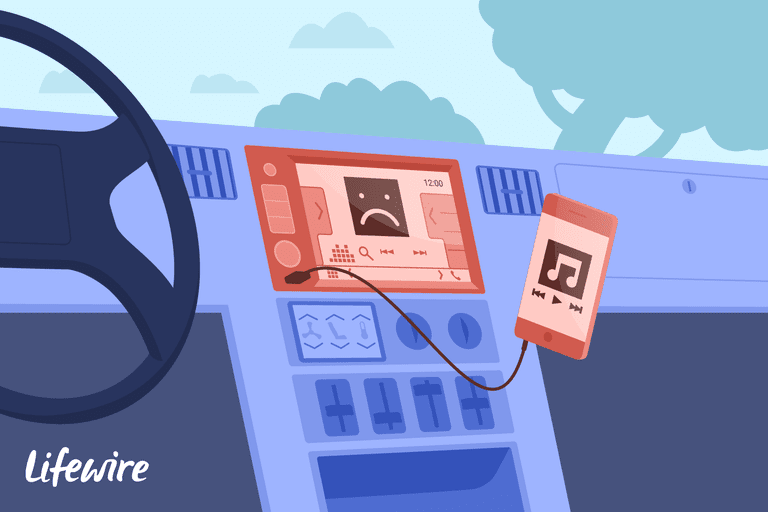 If a phone or MP3 player offers a line output option, it typically provides better sound, and USB also provides better sound quality, but only if the head unit has a USB connection. When you put music on a USB flash drive, or a phone, or any other storage media, it is stored as a digital file. The file is usually compressed as an MP3, AAC, OGG, or another format unless you buy high-resolution digital music. To listen to those files, you need something that reads the data and converts it into an analog signal that can be used to drive headphones or speakers. Whether it’s software on a computer, phone, MP3 player, or even the head unit in your car, the process is essentially the same. In the case of a USB flash drive, what you have is passive storage media that holds song data, but it can’t do anything with that data. When you plug the drive in the USB connection of a compatible head unit or infotainment system, the head unit accesses it just like your computer would. The head unit reads data from the drive and can play the songs because it has the right firmware or software to do so. When you plug a USB flash drive into a USB-to-aux cable and plug the cable into an aux port on a head unit, nothing happens. The thumb drive is incapable of outputting an audio signal, and the aux input on the head unit is incapable of reading the digital information stored on the drive. The same is true of phones and MP3 players that aren’t specifically designed to output sound via their USB connection. The USB connection is capable of transferring digital data back and forth and can likely also be used to charge the device, but it usually isn't designed to output an audio signal. The only case where you would want or need to output audio from a phone’s USB connection to an aux input in your head unit is if the phone doesn’t also include a headphone jack. Some phones, like the original G1/HTC Dream, omitted a headphone jack in favor of the ability to output sound via the USB connection. What Are USB-to-Aux Cables For? USB-to-aux cables have some uses, but they are far from universal across all devices. For example, one use for a USB-to-aux cable is to connect USB headphones to the 3.5 mm headphone jack on a computer. This works for some headphones that are designed to accept an analog audio signal in this way, but it doesn’t work for other headsets that expect a digital output from the computer or require power via the USB connection. The one case where a USB-to-aux cable would be useful for listening to music in a car involves a phone or MP3 player that has a micro or mini USB and no headphone jack. Phones and MP3 players like this are capable of outputting sound via the USB connection, so you should be able to plug in a USB-to-aux cable and have it work. However, charging the phone at the same time in this type of situation is only possible with a Y cable that plugs into the phone’s USB connection and provides both a 3.5 mm aux out for sound and a pass-through USB connection for power.